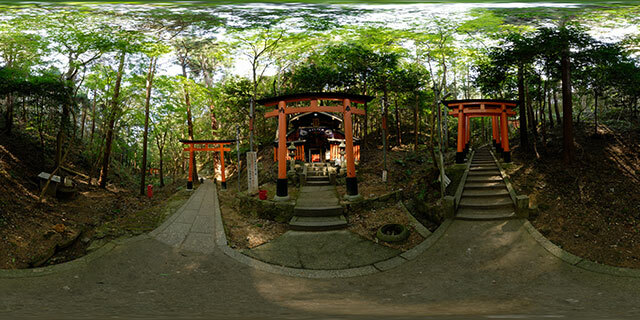 360° VR panorama of a small shrine on the path through Fushimi-Inari shrine, in Kyoto, Japan. Fushimi Inari Taisha (伏見稲荷大社) is a large shrine dedicated to the Kami Inari. Many businesses pay their respects to Inari in order to achieve wealth and business success. The hill that Fushimi Inari is located on is crossed with paths lined with thousands of torii (鳥居) gates, painted in bright vermillion. These torii are donated by business and business people from across Japan. Each gate bears the name of the business or person that donated it. 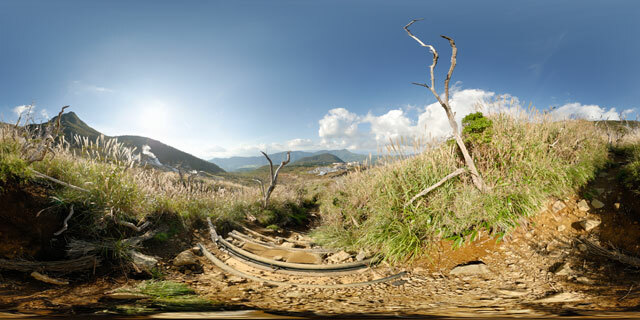 360° VR panorama of a path down the mountain towards Ōwakudani valley (大涌谷) in Hakone, Japan. The dead trees at the sides of the path were probably killed off by fumes from the sulphur vents in the valley. The name “Ōwakudani” literally means “Great Boiling Valley”. In the distance is Kamiyama (神山), the highest peak in Hakone. Covered with clouds in the far distance is Mount Fuji. Hakone is popular with tourists for its mountains and hot springs. 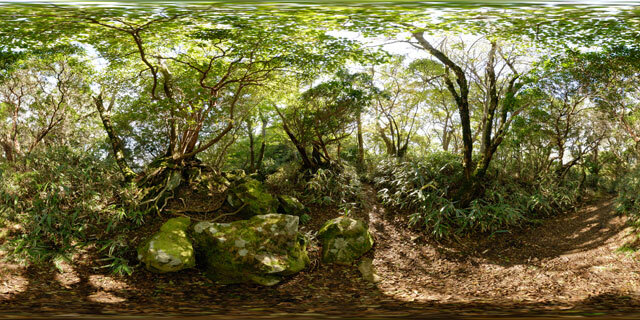 360° VR panorama of a path through the forest on a mountain in Hakone, Japan. The path leads south to Kamiyama, the highest peak of Hakone, with branches off to Ōwakudani valley and Mt. Komagatake. Hakone is a popular area with tourists, having easy train access from Tokyo and featuring mountains, a large lake, and hot springs. 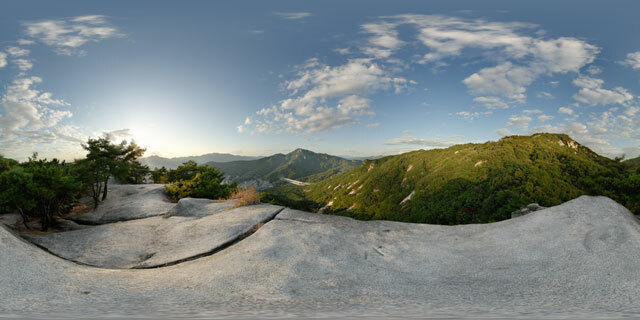 360° VR panorama from a lower peak of Mount Buram (불암산), in Sanggye-dong, Nowon-gu, Seoul, South Korea. To the north-west can be seen a small section of the Seoul Ring Expressway, where it leaves the tunnel from Buramsan and enters a tunnel through Suraksan (수락산). In the distance in the west can be seen the mountains Dobongsan (도봉산) and Bukhansan (북한산), and below can be seen parts of Nowon-gu, a north-eastern district of Seoul. 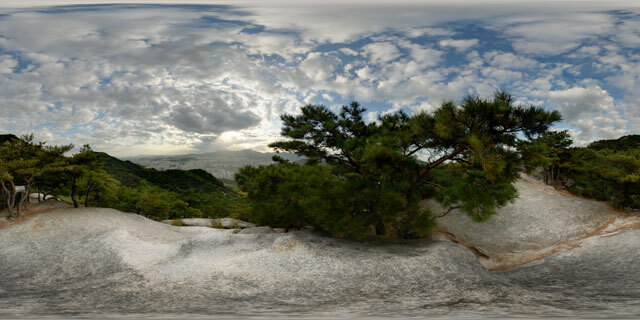 360° VR panorama from a minor peak on the western side of Buramsan (불암산), in Sanggye-dong, Nowon-gu, Seoul, South Korea. Part of Seoul’s urban sprawl can be seen down below, while on the peak pine trees grow out of the granite rock.